A classic Jaguar with a strong tradition of rallying. 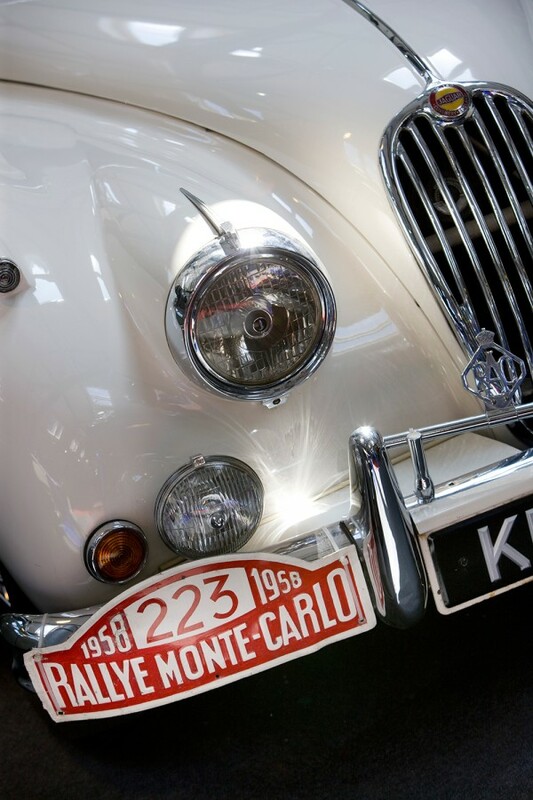 The XK series was conceived by William Lyons as a two seater roadster on a short wheelbase chassis, powered by a twin-cam straight six engine. This vehicle had an extensive rallying history in the hands of G H F ‘Bobby’ Parkes. 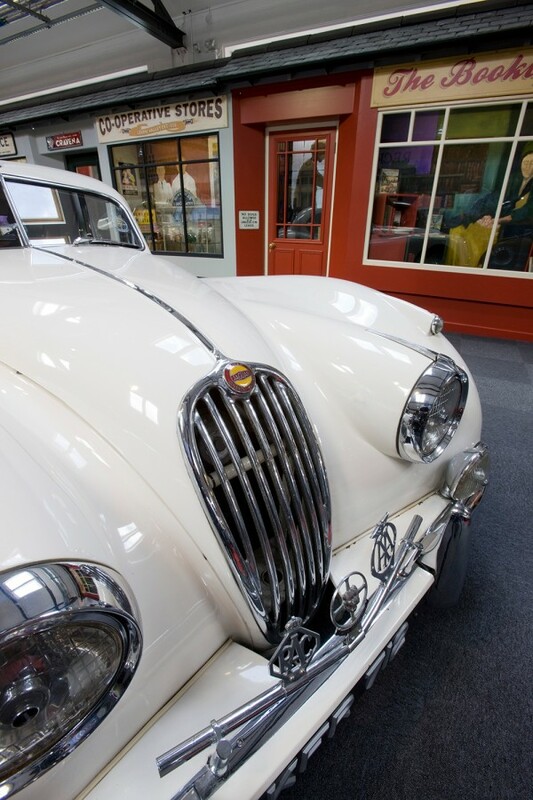 The Jaguar XK140 series was in production from 1954 to 1957, when it was replaced by the XK 150. 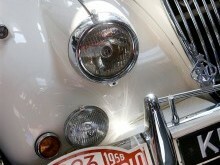 It was a continuation of the Jaguar 120 series, which had been introduced in 1948. 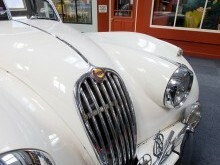 The XK140 was available in three body styles: an open seater roadster; drophead coupe and the fixed head coupe as seen here, the drop head coupe and the super sports – often called the roadster - which featured a simpler hood, side screens rather than wind up windows, and a more water resistant dashboard covering. This vehicle had a long rallying career including the Circuit of Ireland, Monte Carlo rally, Scottish Rally, Morecambe Illumination Rally and many more. 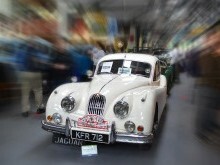 Jaguar released their much admired XK120 model at the London Motor show in 1948. 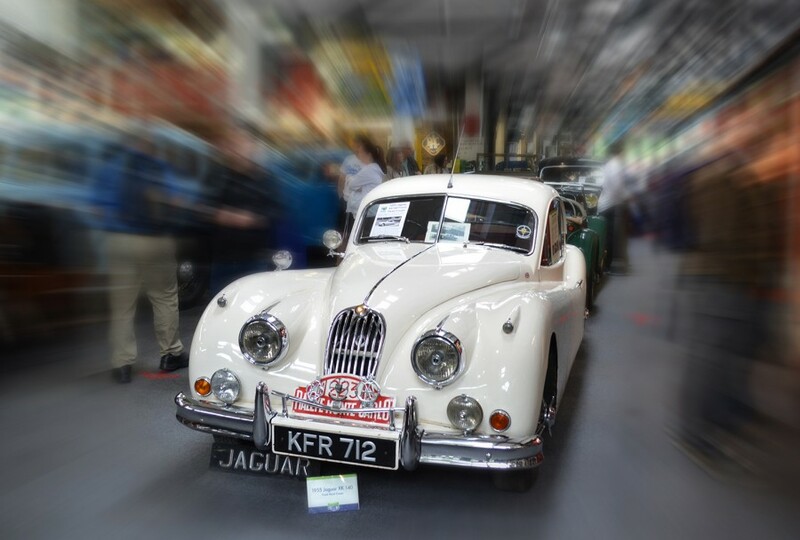 Built as a motor show special to show off the new XK engine Jaguar weren’t intending to put the car into full production but the public’s reaction and numerous orders meant it had to act. Presses were ordered for the complicated bodywork but in the mean time 242 cars were hand built in aluminium over an ash frame – Jaguar’s traditional car building method. These early cars were sold for racing, to film stars such as Clarke Gable and other celebrities. The first steel built vehicles weren’t available in Britain until 1950 and in 4 years just over 12,000 XK120s were built. Success in rallying, racing and record breaking brought more attention to the vehicle, and identified its flaws – brake fade, heavy steering and interior space. Two of these areas were improved in 1954 with the release of the XK140 – which was a 2+2 seater and had rack and pinion steering. 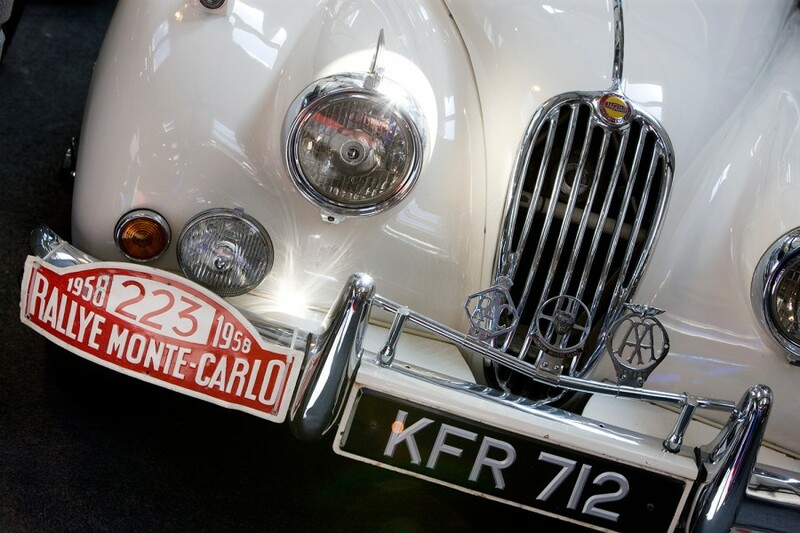 This vehicle has had the third element – braking - improved by the addition of front disc brakes, which were first introduced on the XK150 successor. KFR712 had a long rallying career including the Circuit of Ireland, Monte Carlo rally, Scottish Rally, Morecambe Illumination Rally and many more. 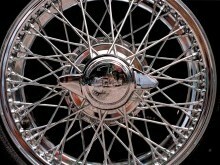 As with the Jaguar XK120 wire wheels or wire-spoke wheels were an optional extra. 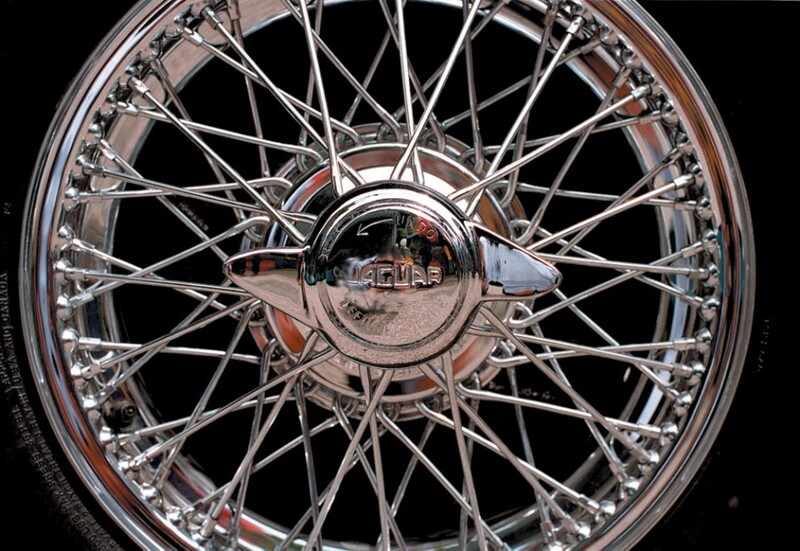 Cars with the standard disc wheels had spats over the rear wheel opening. 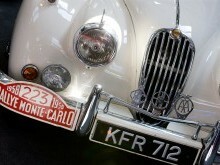 To tell the difference between the xk120 and 140 look at the front bumper. The earlier car has two lightweight thin bumpers, the later one has a heavier full-width bumper to look more like the Mk7 Jaguar that came out in 1950. There were three body styles in the xk120/140/150 range, the fixed head coupe as seen here, the drop head coupe and the super sports – often called the roadster - which featured a simpler hood, side screens rather than wind up windows, and a more water resistant dashboard covering.